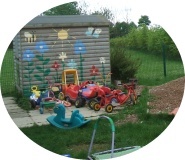 Located in ‘The Cabin’, Borrowby Nursery School provides the perfect environment for children to explore, learn and develop in many different ways. We are extremely lucky to be set amidst rolling countryside, surrounded by fields, wildlife and lots of fresh air! For inside play and learning we have a range of table top activities together with a dedicated painting and messy play table for creative play. The home corner is full of exciting toys which encourage our children to enjoy imaginative play. Amazingly we have a hairdressers, a doctors, a shop, a construction site... all under one roof. Children have open access to a computer in the classroom which helps them to develop computer literacy skills as well as analytical skills and reasoning through the educational games that they can play. We also offer a library service where all of our children are able to borrow books of their choice to take and read at home. We have a “quiet” room for reading stories and for children to rest if they are tired. This room is equipped with comfortable sofas and lots and lots of books! We are extremely proud of our fantastic outdoor play area which has a Willow house as well as slides, cars, trikes and lots more! We also have our very own vegetable garden where children are able to plant and grow their own vegetables and sometimes eat them too! Let’s not forget our wonderful pet guinea pigs & fish lovingly cared for by our children. Finally, but very importantly, all of our meals and snacks are fresh, home cooked and contribute to the 5 a day recommendation of fruit and vegetables. Children have access to fresh drinking water at all times and are able to help themselves throughout the day. Milk is also provided at snack time. Our setting is designed to help all of our children learn more about their environment, themselves and the people around them. Borrowby Nursery School, Playgroup and Hillside Out of School Club serving Thirsk, Northallerton and surrounding villages. © Copyright 2016 Borrowby Nursery School. All rights reserved. Site designed by Qurious Marketing.